Lilith is a recurring character in the fifth season. She is played by Jessica Clark and debuts in “In the Beginning”. Lilith is also known as the Progenitor and is supposedly the “first vampire”, made in God’s image. She’s believed by many vampires to have been created before Adam and Eve, who, according to the Original Testament, were both designed to be her food and to sustain her and her offspring. In the fifth episode of season five it is revealed that within the Authority’s chamber there is a vile of blood that many believe to have belonged to Lilith. However, Roman explains to Salome that the blood is not Lilith’s. And by allowing others to believe that the blood belongs to Lilith he boosts his own, and the Authority’s credibility. This would lend to the idea that Lilith, for whatever reason, no longer exists or possibly never existed though she could be real but vampires deem her to be a myth. Dieter and Rosalyn also seem to know the blood is not Lilith’s as they openly mock the vampire bible and deny her existence. I designed a sheath like bustier for this character with a sarong of ethereal chiffon, adorned with semi-precious stones. If I was styling this character for the show, I would make sure that each look was authentic to the Lilith’s advanced immortality, and or time period she reigned supreme (byzantine area). Fabrics like light weight linen, cotton gauze dyed blood red, and all types of treated and molded leathers for accents would dominate her wardrobe. In “True Blood” Lilith’s character is powerful in her own right. This immortal character comes from a time and place that few humans or vampires can imagine, so her looks would be simple,daring, but incredibly dazzling to look at. I have to admit, “True Blood” has “dropped the ball” when it comes to dressing this character. When Lilith does make an appearance on the screen, she should be seen as the cunning,blood-thirsty ancient goddess she is, NOT as the matted haired, blood strewn savage she is being portrayed as of yet. Being a goddess, and surviving for over 20,000 years, I am sure it would take a lot more than just mere animalistic instincts to survive and thrive for such a long period of time. As a designer, out of all the wonderful characters in the “True Blood” franchise, Lilith would be my favorite to design and style for. A designer would have to research styles, jewelry, and customs from ancient long dead civilizations, becoming an archeologist in a sense. History of this great world has always fascinated to me as a designer, and with Lilith I would have a great opportunity to present to the world styles, fashions ,and looks that have not been seen by humans for thousands of years. I would also like to add that this is the last character form the “True Blood” franchise that I will be designing for. I started this project to garner some awareness for my talent and small freelance design business here in New York, and I have done just that! 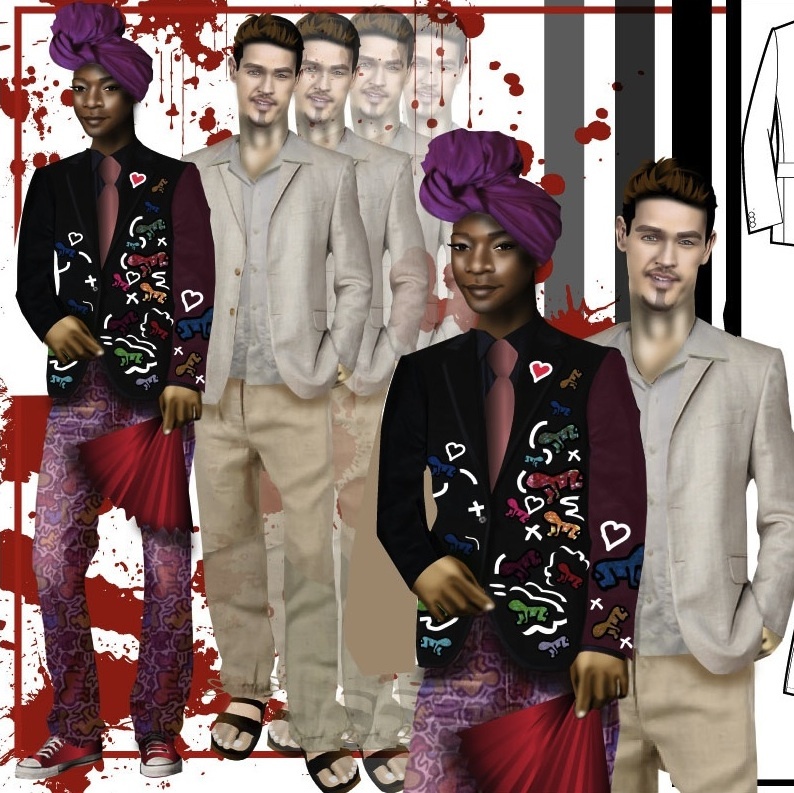 “True Blood – Fashion Pinpoint” has been my MOST popular topic on this blog, with views from over 45 different countries world wide. It has been exciting, and look out in the coming days for what my NEXT design project will be. As many of you know,…I am a fashion designer, fashion is constantly changing, and so am I. Stay tuned for more apparel designs, illustrations,,branding done MY way. his life. He is the kind of guy with a sense of black humor. Jesús Velásquez (pronounced heh-soos) was the boyfriend of Lafayette Reynolds. managed to get Lafayette to join the witch coven of Marnie Stonebrook, a friend of his. I love Lafayette and Jesus as characters, the only gay couple on “True Blood”. is fun, with sequined Keith Haring graphics down the left arm, front and left yoke. guayabera shirt, coupled with a tailored linen blazor , and linen drawstring pants . Sookie Stackhouse is a human-fairy hybrid, introduced in the first season of True Blood. Sookie is the most prominent main character on the show and is played by Academy Award-winning Canadian Kiwi actress, Anna Paquin, in her Golden Globe-winning television role. Sookie also appears in the The Sookie Stackhouse Novels as the titular character and narrator of the stories.Season 5 is presenting Sookie stronger and more sure of herself, but finding out more about her troubled past as an orphaned child. Sookie is presented with major situations this season that will be sure to change her character drastically, maybe for good. In the looks that I assigned, I wanted to give Sookie a make-over based on this new attitude, a style that is so much more sophisticated than jeans, tees and a ponytail.The fist aspect of this look is that dramatic cut&sew croc leather cropped jacket. 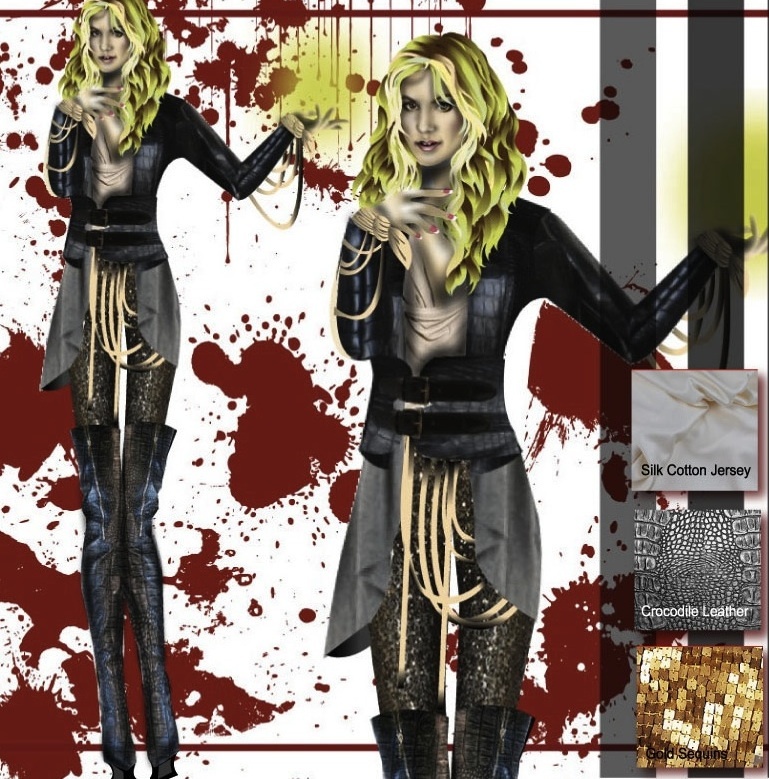 The patchwork construction of this garment resembles Sookies “bits and pieces” of her persona that is being “reassembled”, through the revolution that she may indirectly be responsible for her parents death. This creative jacket can also symbolize her torn and ripped feelings concerning her love for Bill and Eric. The cropped jacket is equipped with a self fabric wide belt, shaping the waist, slimming the overall silhouette of the female body. The ultra strappy silk jersey draped tee is worn under the jacket. This piece, to me symbolizes Sookie true spiritual origins as a fairy-hybrid. This dramatic tee is meant to look and feel so ethereal and beautiful, reminiscent of ancient greek and roman togas. The jeans are stretch, encrusted with stones and sequins, clear symbolism of Sookies’s power as a fairy. The whole look is complimented with ultra high croc boots. Strappy, sleek, but daring, the boots are meant to symbolize the strength that Sookie’s must take on in order to fight all vampires that are after her blood. 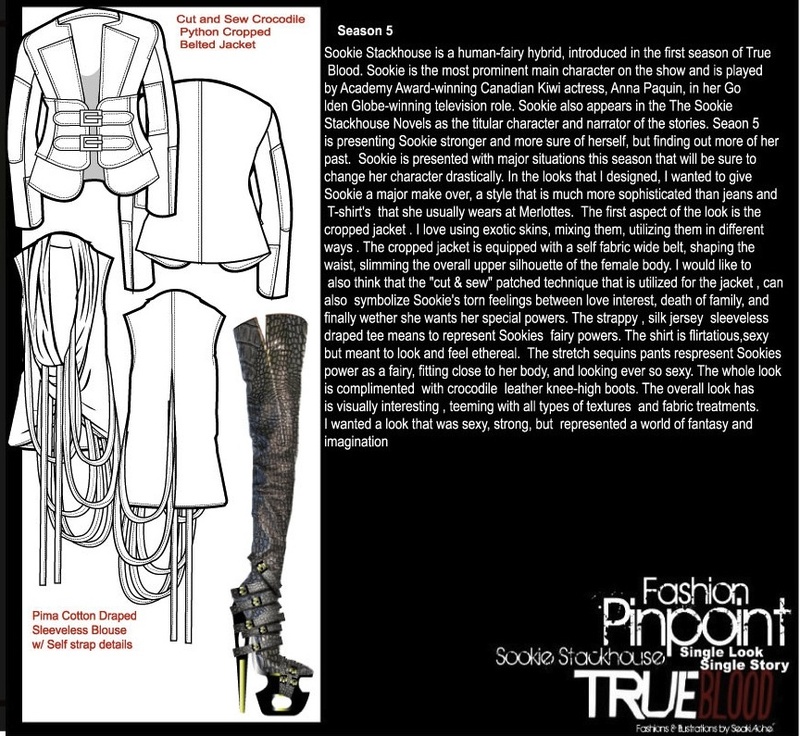 The boots are ultra feminine, but were designed to look dangerous and sinister, and being that they are detailed in pure silver, they are dangerous to vampires. I wanted to design a look that represented imagination and fantasy, but not forgetting the many trails that Sookie will have to endear in order to find out who and what she wants to be.